Thirty five years ago this month Lesley, my pretty young bride, stepped out from behind a Hawthorn and right there we were married in the middle of a grove of Downey Hawthorns in full flower. Every year when the Downeys dress up in their creamy, white clusters of daisy like flowers, we remember that happy day. 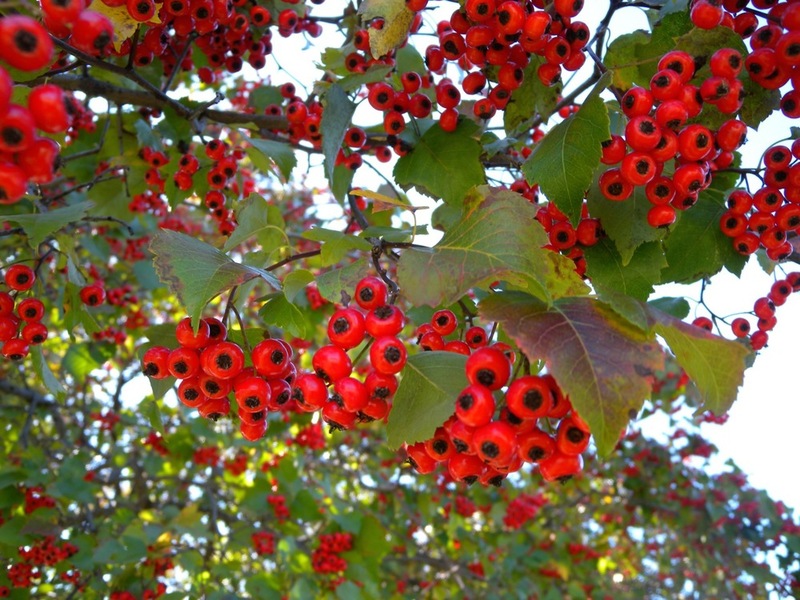 If you were to pin me down I might say that the Downey Hawthorn is my favorite tree. 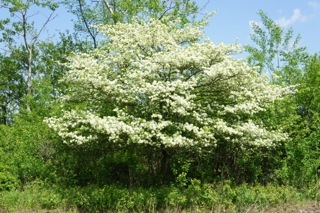 Its a tough, thorny, native, prairie tree, one of the few that could stand up to the harsh conditions northern Illinois threw at it, like fires, and still ably compete with the mighty prairie. I love the horizontal branches seeming to defy gravity as they gently arch almost to the ground. The sinewy trunk speaks of graceful aging, as each year older it looks more lovely. There are specimens that continue to live at the Morton Arboretum that pre-date the Arboretum itself perhaps older than 200 years. Beautiful in the summer as well as the winter, don’t let a few thorns point you away from the Hawthorn. 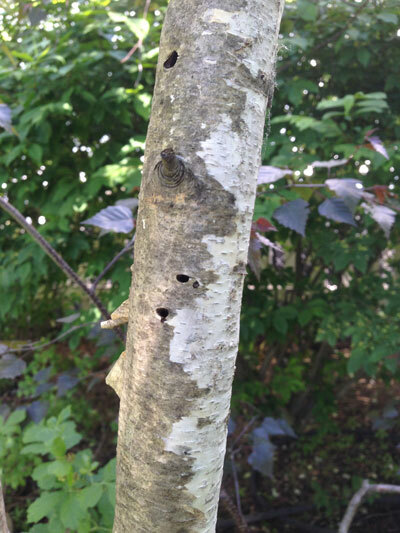 Bronze Birch Borer: Who is the bad guy, the Birch Borer, or the Birch Planter? But dipped it’s top and set me down again. In Concord Massachusetts around Walden Pond the famous White Birch trees are dying. They are dying in Door County, Wisconsin where they are native and in the Chicago area where they are not native. If you Google it you will learn that the culprit killing our birches is the Bronze Birch Borer and the remedy is to kill the borer. Most people assume that the Birch Borer is an invader with no natural predators like the Emerald Ash Borer and that the only options are to give up on growing our beloved White Birch, or to pour on the pesticides. Don’t worry, there are other options. So let me tell you a story about White Birches. They are, like our European ancestors, a pioneer species. They grow on the edges of the forest and they are the first to colonize burnt or logged out areas. A fast growing and relatively fast dying tree, in a sense Birch prepare the way for the slower growing, climax forest. That’s their job. They live about 100 years. Coincidentally about 140 years ago we stopped using trees as our primary fuel source and so stopped creating massive empty spaces for the Birch to colonize. Today, the lovely stands of White Birch that Robert Frost was familiar with are old,weak and it is time for Maple and Beech to succeed them. Nature efficiently recycles everything and in this case the Bronze Birch Borer is the good agent of change. The female Borer beetle flies around avoiding healthy Birch trees and laying her eggs only on failing birches. She knows that her eggs will not survive in a healthy Birch so she doesn’t bother. To us, however it appears that the borer is killing the lovely stands of Birch in New England when what we’re seeing is just a normal, natural, healthy life cycle. Travel 1000 miles west to our Prairie State and you will also observe dying, borer infested, White Birch. In this place the Birch are not weakened by normal aging but by being planted in heavy clay soil. They don’t like it. But we love them, and so we blame the poor Birch borer. Or we plant borer resistant River Birch or hybrid Birch. Neither of these like our alkaline, poorly drained, heavy, clay soil either and...its just not the same as a delicate Paper Bark Birch. I ask you, who is the bad guy, the borer or the one who plants the Birch? But we just can’t help ourselves! We want, like Robert Frost, to imagine being “swingers of birches.” So what do we do? Here’s the secret that surprisingly most of the landscapers don’t know. These are the Morton Arboretum’s recommendations for non-chemical control of Bronze Birch Borer. Enjoy your White Birch while it lasts which may be 50 years and then thank it and let it go. Lichen, Should We Like it or Not? We so often get asked questions about the “green fungus thing” growing on trees, usually with concern that something is wrong with the tree. This is not just a fungus, but actually a unique composite organism of both fungus and a photosynthetic partner of algae. The fungus actually surrounds the algal cells and the resulting organism becomes much different than either the fungus or the algae separately. It is a pioneer “plant like” species called lichen that can grow on rocks, sterile soil, sand and tree bark. It is an important nitrogen fixer that supplies nutrients to the soil and can grow in very harsh conditions. There are thousands of species of lichens and they are found in every corner of the globe, both in extreme cold and desert heat. Lichens are sensitive to pollution and as such are a good marker for environmental problems. If you have lichens, it means your air is less polluted. It is an important food source for caribou in the far north and we have seen it used in the nests of hummingbirds. 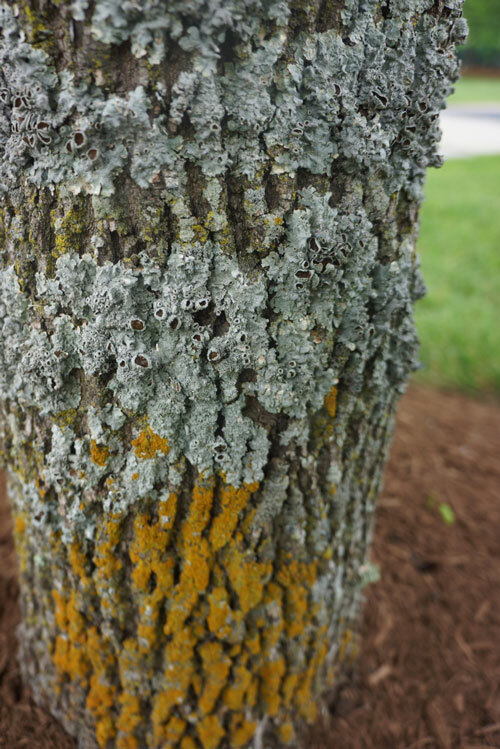 The important thing with regards to trees, is that lichens live in a happy relationship with the trees and are in no way harmful or an indication that anything is wrong with your trees. 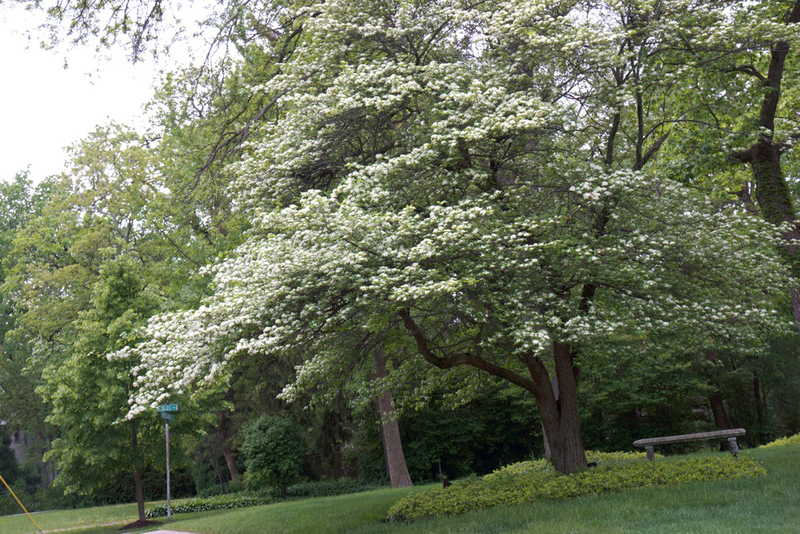 We usually see it on the north side of tree trunks or in more shady or moist conditions. So when it comes to lichens, we can like them.